We’ve already learned that fall is the best time for planting. But one of the best parts of adding plants to your home is being able to enjoy the fruits (or vegetables!) of your labor. The use of edible plants can be a key ingredient for conservation landscaping practices. 42 million households already grow edible plants at home or in a community garden, and for good reason. Plants are always a recipe for success when it comes to a variety of environmental, economic, and health benefits. But what do edible plants have to do with stormwater runoff? “Every time you slip a quarter into a vending machine or buy groceries, you impact everything from the vacant lot down the street to the water in the Gulf of Mexico,” writes Celia Barbour in “A Delicious Revolution”. If these everyday decisions can have a ripple effect far away, it is easy to imagine how those same choices can impact water quality closer to home in local waterways and the Chesapeake Bay. Edible plants help keep our bodies and our bodies of water healthy. By adding native plants to your home, you can make runoff work for you. For those Runoff Busters who live in an apartment or townhouse with little yard, edible plants can be a small scale and space-conscious means to incorporate more greenery and native plants into your home and have access to homegrown produce. 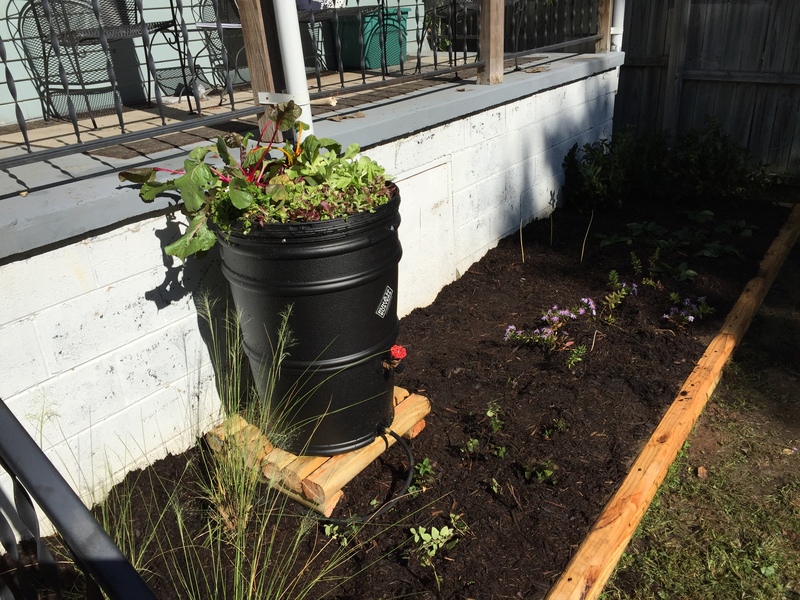 Potted edible plants can be placed on a porch or patio, on your kitchen counter, or even in a rain barrel planter! Avoid the “first flush”: the initial rainwater that drains off your roof has high levels of contaminants, such as bird waste. Regularly clean your rain barrel: clean the barrel with a 3% bleach solution and wait a full day before using it to irrigate plants. Research your roofing material: some types of roofing, such as wood-shake, are likely to release more pollutants. Avoid getting water on the plant: Instead, apply water around its roots so the soil can filter the runoff. Wash your produce before you eat it: This should be self-explanatory! Parsley, sage, rosemary, and thyme…all are edibles that can be enjoyed during the fall. But that’s not all- other herbs such as chives, cilantro, and wild mint; leafy greens like arugula, kale, and spinach; and other veggies like asparagus, garlic, turnips, carrots, and Brussels sprouts are all fall edible plants. Even better, some plants native to the Chesapeake Bay watershed, like blueberries and Jerusalem artichoke, are also edible!